This is review No. 5 of 16 in the first round of our competition. Each review will compare four burritos, with my favorite advancing to Round 2. In this article I begin my foray into what we call the West, where I spend 24 hours driving 1,500 miles to eat burritos in Oklahoma, Texas and Denver, and sample something called the Mexican Hamburger. I left Tulsa behind and headed west to Norman, Oklahoma, to the first burrito-selling establishment I’d visit in the Burrito Bracket’s West region. I needed to make an early lunch in Norman so I could get to Austin, Texas, before Cabo Bob’s closed for the night. It was going to be a two-burrito day. 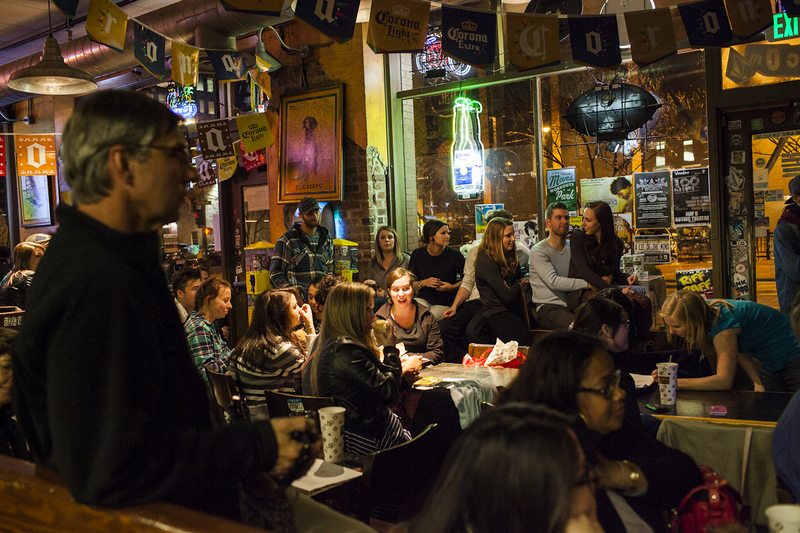 Norman is home to the University of Oklahoma, and in true college-town style Pepe Delgado’s is nestled between a Sooners Athletic clothing store and a tea cafe, in an area appropriately named College Corner. Salsa music played from speakers, bathing pedestrians in trumpet sounds as they walked by. I showed up around 11 a.m. for what I thought would be a quiet, early lunch, but Pepe’s was packed. Every seat was taken in a small front room with windows onto the street, as were the tables in the main room. I waited in line to order at the counter, hoping a seat would open up. 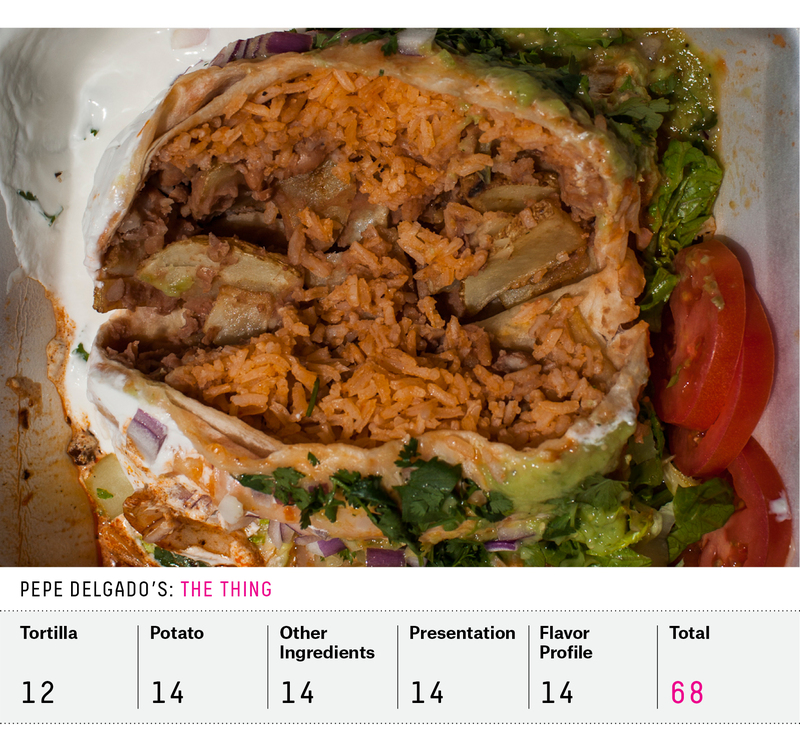 Yelp had clued me in to a secret item that doesn’t appear on the menu but seems to be a favorite, “The Thing,” a gargantuan vegetarian burrito. It’s the biggest dish Pepe’s serves, according to the woman who rang me up at the register, and is filled with medallion-shaped potato slices, hearty pinto beans and rice. It’s then covered in a lip-puckering acidic tomatillo sauce on one side, and thick, stark white crema on the other. There’s no major protein in this burrito; the potatoes serve as the main ingredient. When I cut into the burrito, the distinct smell of potatoes from a grill floated through the air, rustling memories of late-night diners. The first bite released the smoky flavors, but the textures of the three interior ingredients were so similar they could have been one. The burrito was huge, and I was a bit bored halfway through, except for the tart and creamy toppings. It’s served with fried onions and salad. I drove into Austin on Highway 35, which cuts the city in half. I was headed to the Cabo Bob’s site on Ben White Parkway with just 45 minutes until close. Inside, the place feels like a converted warehouse, though it’s in a strip mall, with high ceilings and exposed beams. Bob Marley played on the speakers, a painting of a white and blue wave covered the wall above the kitchen, and surfboards hung from the ceiling. Drinks came in a plastic souvenir cup featuring Bob’s logo. After expressing my dislike for flavored tortillas last week, I arrived at Cabo Bob’s to find all they have are flavored tortillas. But these aren’t your garden-variety spinach and sun-dried tomato wraps; at Bob’s you chose from ancho chili, smoky cheddar, cilantro tomatillo or buttermilk. The flavors are in line with each burrito’s flavor profile, and enhance the other ingredients. Not only that, they’re made fresh when you order. 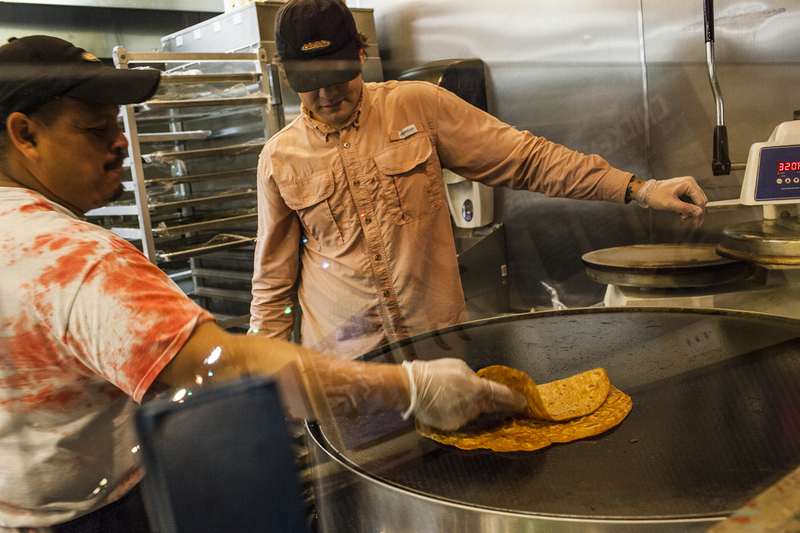 The batter is placed on a massive round slab of a stovetop, and the tortillas are flipped continuously until they’re ready to move to the burrito assembly line. I ordered the brisket and queso, which comes with the ancho chili tortilla, as well as brown rice, pinto beans, grilled onions and peppers, lettuce and cilantro. I initially declined the sautéed peppers and onions, then realized these weren’t the kind that come with Italian sausage at fairs, but rather poblano peppers, sautéed to a glowing green. The tortilla had an enormous personality; it was smoky, honey-colored, almost crepe-like when I bit into it. Not the texture I was expecting, but it worked in this burrito. The queso was neither electric orange nor congealed. It was pale yellow, providing a faint oozing creaminess to smooth out the astringent poblanos, sweet sautéed onions and meaty brisket. 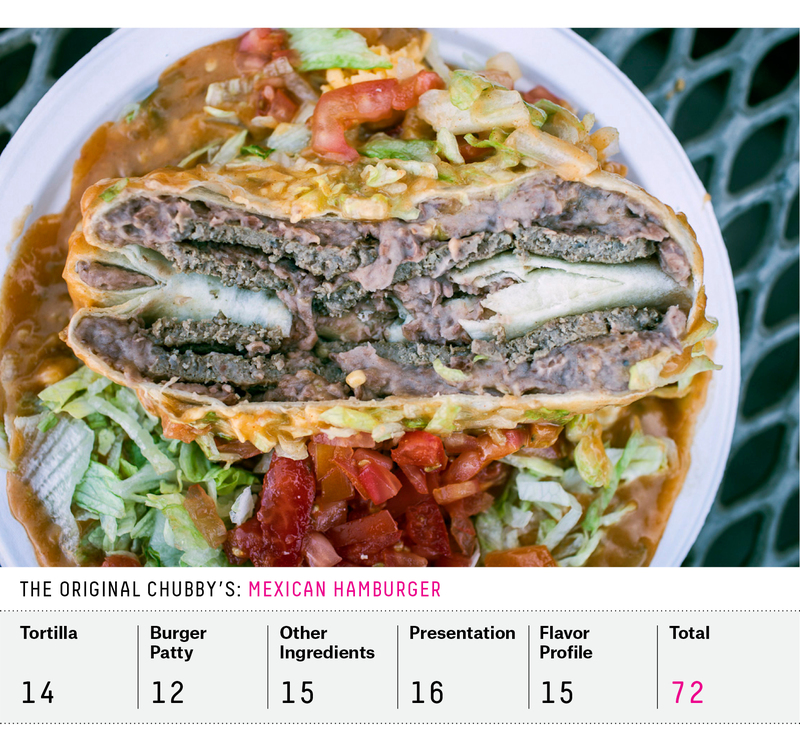 I’ve searched the Internet far and wide, and I can’t find an explanation of why burritos are so insanely popular in Denver (aside from the fact that they are delicious). Scattered around the city, men and women sell burritos from coolers on street corners. There seem to be as many homegrown, independently run brick-and-mortar operations. And, of course, Denver spawned Chipotle, which serves Mission-style burritos, but is responsible for bringing burritos to the far corners of the United States. 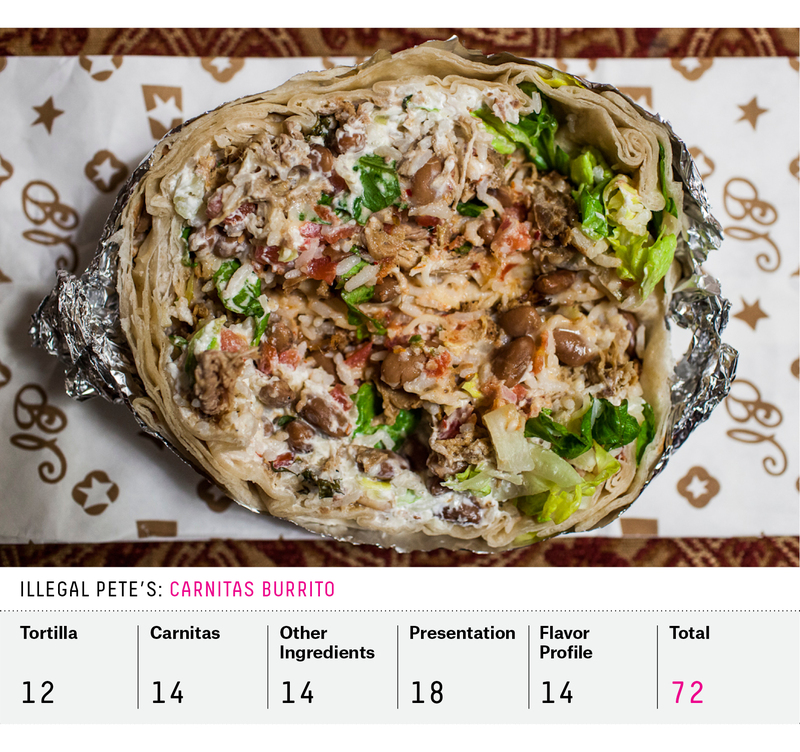 In March, FiveThirtyEight’s Burrito Selection Committee had settled on two Denver locations: local favorite Illegal Pete’s (which took the fourth seed for the West with a San Francisco-style burrito) and a takeout-only establishment that serves an obscure style called the Mexican Hamburger. Since we launched the bracket, I’ve received no shortage of emails, comments and tweets about the great places in Denver that didn’t make the cut. At the end of the assembly line, Illegal Pete’s executes its signature move. The preparer grabs a spoon from a metal tub and mixes the selected ingredients atop the tortilla. Several flicks of the wrist later, the ingredients are perfectly distributed for greatness in every bite. The salsa was tasty, but the sour cream so cold it chilled out my burrito in unpleasant ways. The carnitas provided the texture but left the flavor somewhere other than my meal. 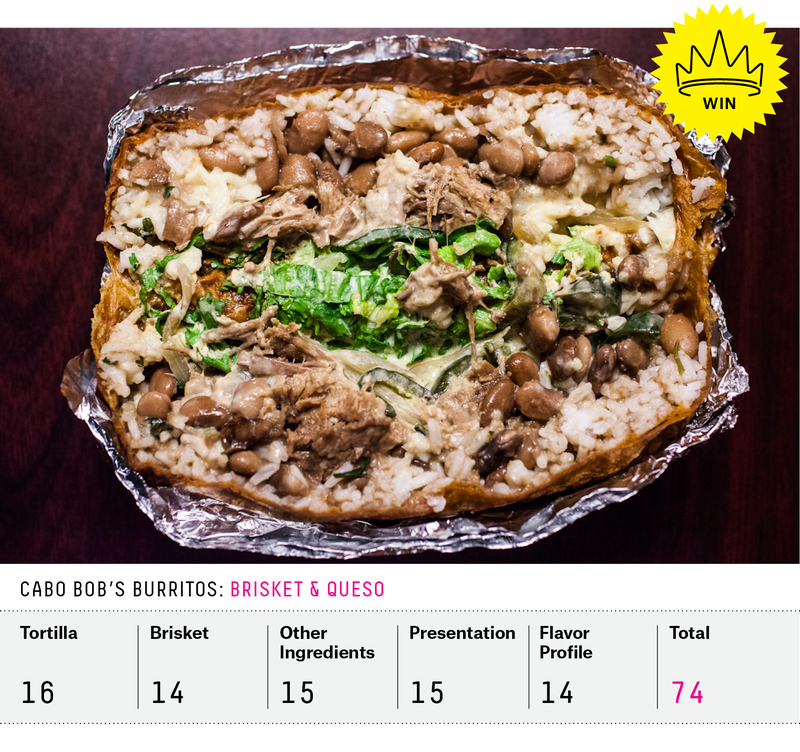 This is a great burrito for the masses — it doesn’t have a lot of personality, which means it doesn’t stand out, but its mildness seems to make it a friend to many, especially if the online reviews are to be believed. The place, however, is full of personality. I took a seat at the bar, where I was surrounded by enthusiastic Avalanche fans watching the game on a television in the corner. On the opposite side of the restaurant, a band set up on a small stage. As the game was heating up, the band got to playing; rock-n-roll bluegrass and hockey fans, together in perfect harmony — who could have predicted that? 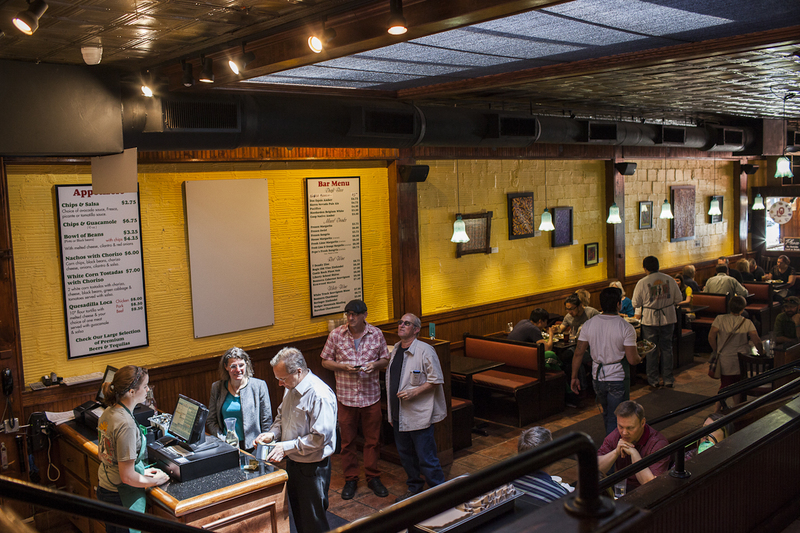 Bumper stickers cover the walls, and tattoos cover the workers and patrons. I ordered a burrito to dissect back at the hotel room. It came in a white paper bag, emblazoned with golden Is and Ps in a nod to the Louis Vuitton logo. 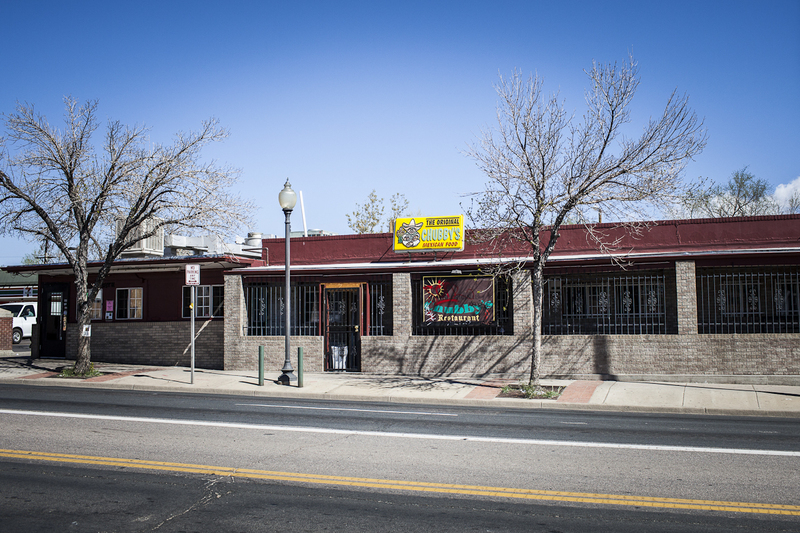 Contrary to logic, there are several “Original Chubby’s” in Denver. Of course, the can be only one, and for Chubby’s, it’s on the corner of 38th Avenue and Lipan Street. I’d checked online to find the hours, 6 a.m. to 3 a.m., and showed up for a late breakfast/early lunch (this was no brunch) at 10 a.m.
An Original Chubby’s sign at street level was covered in graffiti, and attached to the metal bars of a building that was closed. While I was peering inside, a man in the shadows looked at me and said, “It’s there.” He pointed to the attached building on the corner, which also featured bars on tiny windows, as well as a low roof and no sign. Inside, a counter and nine chairs were packed with patrons waiting for orders at the carry-out only establishment. There were seven orders in front of mine, so I took a seat in one of the chairs, with a TV tuned to the “Today” show spewing DIY tips. Above it, a slew of news stories hung from the wall, telling the history of Chubby’s (explaining why there are so darn many, but only one original). The story goes that Stella Cordova was a cook at the hamburger stand that preceded Chubby’s. When the previous owner decided to sell, he convinced her to buy it for $2,000. Then she added chili to the menu. It was delicious, people came, and others copied. Cordova was not the creator of the Mexican Hamburger; that distinction goes to the now defunct Joe’s Buffet, according to Burrito Selection Committee member Gustavo Arellano. But Cordova’s restaurant is certainly the contemporary keeper of the art. The burger meat was well done, and tasted better than a fast-food patty. The refried beans were dark in color, suggesting they’re made from black beans, and spread as a thick, tasty, salty paste between the patty and tortilla. The burrito was topped with fresh, wet lettuce and tomato and served on a paper plate with another stapled on top, just four staples between a world of delight and total mayhem. The thick, green chili, which was actually more orange in color, filled the well of the plate to the brim, seeping into every empty crevice. The chili sauce was thick like overcooked gravy. The meat was cooked more for ease of cutting than eating. And still, the Mexican Hamburger was delicious. Picking a winner in this pod was incredibly tough, mostly because there was no standout. The mixing technique of Illegal Pete’s picked up where the burrito lacked in personality; it’s probably the burrito I’d want to eat most regularly of the four. The Mexican Hamburger was unique, and it’s the one I want to go back and eat right now. But Cabo Bob’s brisket and queso, with the made-to-order tortillas and flavorful ingredients, was the classiest food, and the best overall combination. When I added up the numbers, Cabo Bob’s scored a narrow win.